In 1986 Anthony Burgess published The Pianoplayers, a ribald, mainly light-hearted story about the picaresque adventures of Ellen Henshaw and her dissolute pianoplayer father Billy in the silent cinemas and pubs of 1920s Manchester and Blackpool. Drawing heavily on the details of Burgess’s own early life, the novel balances its portrayal of the grim poverty and deprivation suffered by the exploited underclasses with affectionate nostalgia for the popular culture and humour of the time. The Pianoplayers is an important and unjustly neglected piece of writing that, especially when read alongside the first volume of Burgess’s autobiography Little Wilson and Big God (1987), provides a great deal of insight into his formative influences. 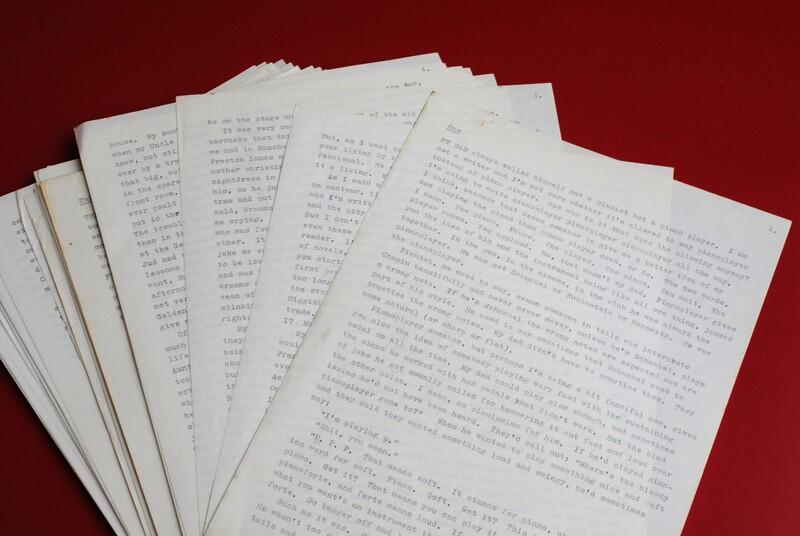 This complete manuscript from the collections here at the International Anthony Burgess Foundation is not dated, but evidence from letters between Liana Burgess and Gladys J. Carr, senior editor at the McGraw-Hill Book Company in New York, indicates that the novel text was completed by June 1977. The author is apparently a writer called ‘Josephine Kell’. Burgess had previously written two novels as ‘Joseph Kell’: One Hand Clapping (1961) and Inside Mister Enderby (1963), the pseudonym being created on the advice of his publishers to try and obscure the large number of novels by Anthony Burgess appearing in quick succession in the early 1960s. ‘Josephine Kell’ appears nowhere else as a pseudonym in Burgess’s writing, and she does not survive into the novel as eventually published, but it is clear that there is at least some relationship with these earlier books: One Hand Clapping is the only other Burgess novel with a female narrator. The manuscript itself, in common with the majority of texts in the collections, is only lightly corrected and annotated in Burgess’s hand. Minor emendations are made to adjust spellings and there are a few small changes in expression. However, the published novel did not appear in quite this form and there are some important structural differences between this manuscript and the final shape of the text. 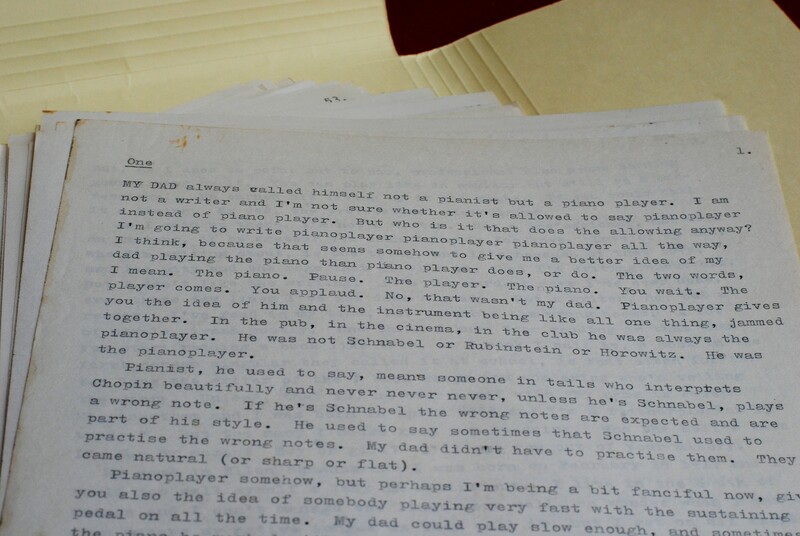 For example, this 1977 draft omits a framing narrative of an elderly Ellen Henshaw reminiscing about her life in Manchester in the 1920s, and instead plunges the reader straight into the main story with a young Ellen being taught to play the piano by Billy. Later in the novel, her father’s attempt to complete a pianoplaying marathon to save the fortunes of the family is placed as the very last chapter of the manuscript as its hilarious but tragic climax: the published novel instead digresses into anecdotes about Ellen’s later life and adventures, and the effect is quite different. In sum, the 1977 manuscript presents a shorter, perhaps more sharply focussed narrative that draws very heavily on Burgess’s own autobiography: there is rather more distance and expansiveness in the novel that we know today. 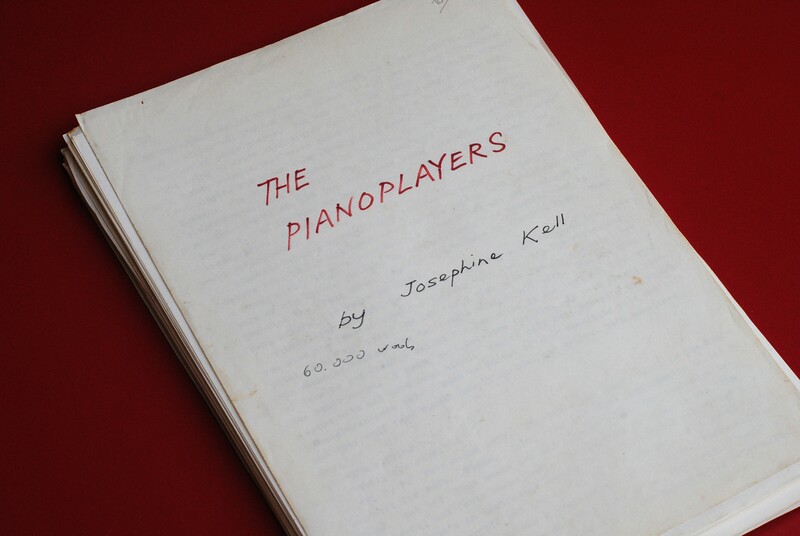 The US publishers did not take their interest in The Pianoplayers forward in 1977, but the novel did not disappear from Burgess’s plans: the text was revised in around 1981, and an almost complete manuscript dated 1982 is in the Burgess collections at the Harry Ransom Center at the University of Texas at Austin. The publishers Hutchinson in London, who brought out Burgess’s books from 1976 until after his death, produced the book four years later. The Pianoplayers has often been considered by critics to be so autobiographical as to function merely as a precursor or warm-up to Burgess’s own memoirs. 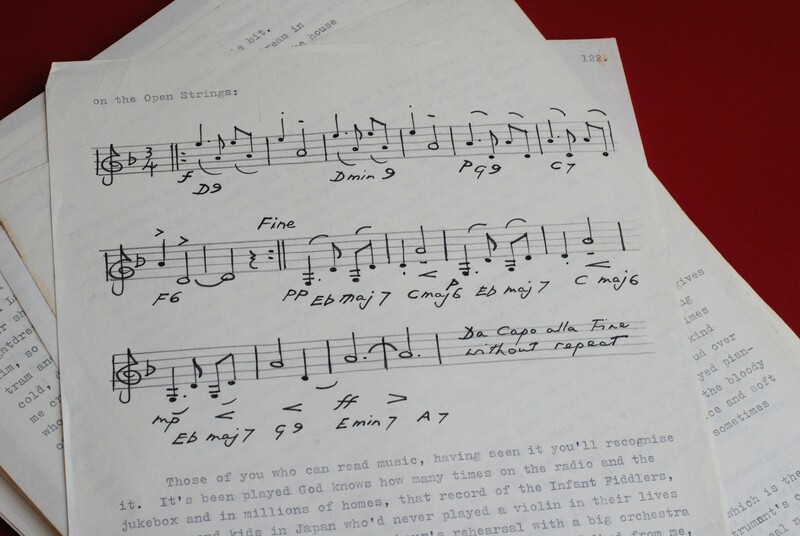 However, placing The Pianoplayers in its original context of Burgess’s ambitious and experimental writing of the 1970s – such as Beard’s Roman Women (1976), in part a meditation on the death of Burgess’s first wife Lynne – offers the opportunity to consider it as a far more nuanced piece of work. The 1977 manuscript gives us a way into these questions, and will continue to provide insights for scholars and researchers; as well as giving us a new angle on one of Burgess’s warmest and most celebratory books. The Pianoplayers has been republished this month in a new critical edition with Manchester University Press, including a new introduction by Will Carr, comprehensive notes and the restored text of the novel, as well as a selection of contemporary reviews and a little-known short story by Anthony Burgess, ‘An American Organ’. The Pianoplayers is available from all good bookshops. For more information on this novel and The Irwell Edition of the Works of Anthony Burgess, click here.